Thanks to volunteers, Stillwater Mountain’s 47-foot edifice is open to the public again. 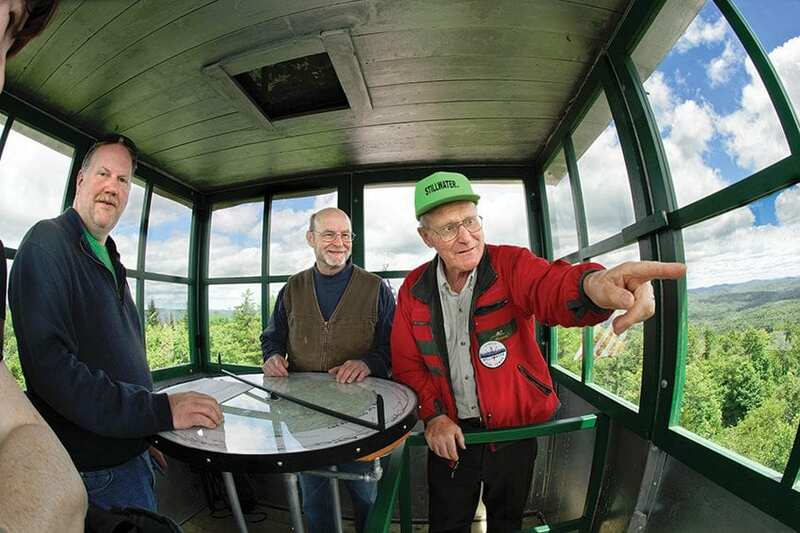 Retired Forest Ranger Terry Perkins, right, points out points of interest to Bob Hough and Bob Lehman on the Stillwater Mountain fire tower during grand re-opening of the tower. Cathy Percy stands in the cabin of the Stillwater Mountain Fire Tower. She and her visitors are forty-seven feet above the footings set into the bedrock at the top of the mountain. The peak itself is a modest 2,264 feet above sea level, but from the cabin, you can see forever in every direction. Outrageous. Jaw-dropping. Stunning. It is difficult to find just the right words to describe the vistas available from the forty-seven-foot tower, built in 1919 but out of commission since 1988. The volunteer group and the state Department of Environmental Conservation joined forces a few years back to refurbish the structure and improve the mile-long trail from Big Moose Road. Marked by blue disks, the trail climbs 525 feet. The trail starts on Forest Preserve, but the summit is owned by Lyme Timber. The state holds an easement for the portion of the trail that crosses private land. Jim Fox addresses hikers who gather on Stillwater Mountain for the grand re-opening of the Stillwater Fire Tower. 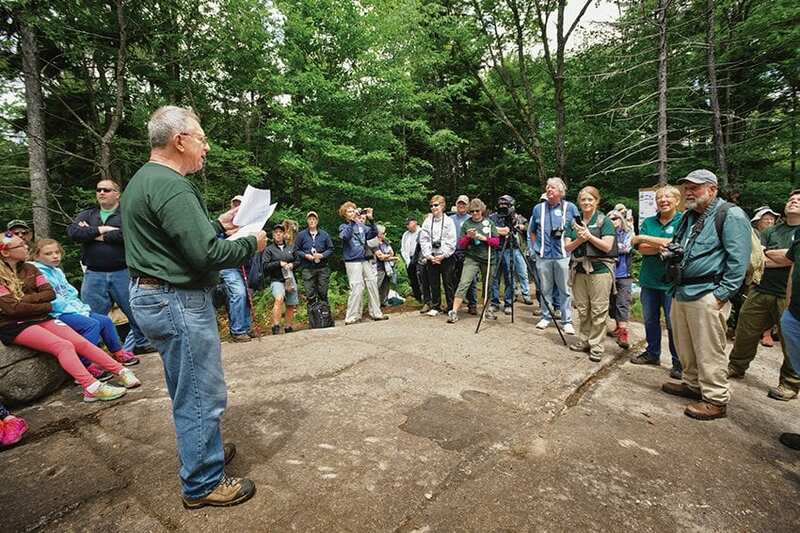 A spirited dedication ceremony was held on the mountain July 2, with nearly three hundred volunteers, well-wishers, sightseers, and DEC officials attending. Percy was one of those celebrating. She grew up in the area, and her grandfather, Ken Hite, was one of fifteen fire observers who staffed the tower during its eight decades of service. 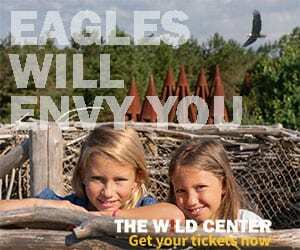 She was one of the many volunteers who helped make the project a reality, partly in hope of giving the community of Stillwater something to crow about, partly to make it a tourist destination. As she spoke with visitors, Percy could point to Whiteface Mountain, sixty miles to the east. The 190 windmills on Tug Hill, past Lowville, were easily visible twenty-five miles or so to the west. Hundreds of thousands of acres of forest, rivers, ponds, and lakes could be seen in every direction. 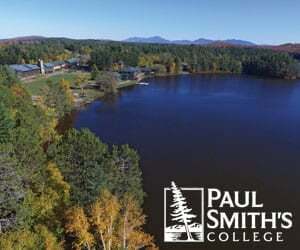 On a clear day, Algonquin Peak and Mount Marcy, the state’s two highest peaks, also are in view. Hikers make their way up the Stillwater Mountain fire tower. A circular table map, a faithful copy of the 1920 original, helps line up landmarks along the entire horizon. The whole world, or a big hunk of it, seems within your grasp from the cabin. Outrageous, jaw-dropping, stunning, indeed. Percy and scores of volunteers helped make it so. She painted the cabin, including the roof, which she did with the aid of a harness. Harry Peck, who works in the welding business, was able to secure much of the gear needed for the improvements, including replacements of out-of-date, century-old nuts and bolts. Jim Fox, a retired school psychologist and Stillwater resident, headed the group, and in a very passionate way. Fox’s interest was piqued by a 1910 photo of his wife’s ancestors—her great-grandfather Henry Churchill and grandparents Clarence and Louise Churchill Shaver—on an earlier, wooden tower. 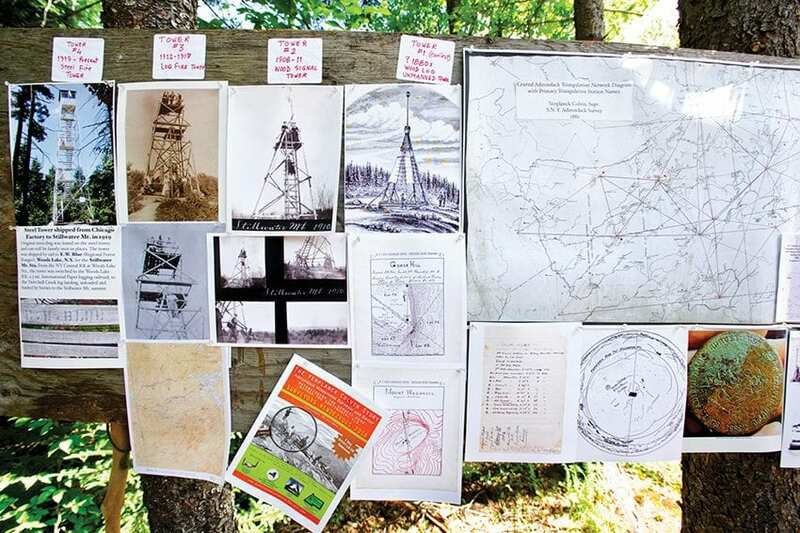 Stillwater Mountain had been used as a triangulation point by Verplanck Colvin during his survey of the Adirondacks nearly thirty years before, and it is believed there were at least a couple of signal towers before the first wooden fire-observer tower was constructed in 1912. The photo was a taking-off point for the effort by the Friends of Stillwater Fire Tower group to rehabilitate the steel tower, honor its history, and bring some renown—and additional visitors—to Stillwater. Apparently, a few people in Stillwater—you can’t say a lot because even with summer residents the population is sparse, to say the least—weren’t happy about that. Now, with a solid, safe platform that allows people a panoramic view of much of northern New York, they have another reason to be happy. Photos of former Stillwater fire towers on Stillwater Mountain for the grand re-opening of the Stillwater Fire Tower. Everyone certainly seemed to love it on dedication day. Remsen’s Erin Hamlin, the Olympic Bronze Medal winner in the luge, was there with her parents and brother. Art Van Vechten of Westmoreland, who belongs to a hunting club down the road, climbed up with his adult daughter, Maureen. He has hiked to the tower occasionally over the last thirty years. Maureen said it was a “bit of a pain” to walk up to the tower but well worth it. 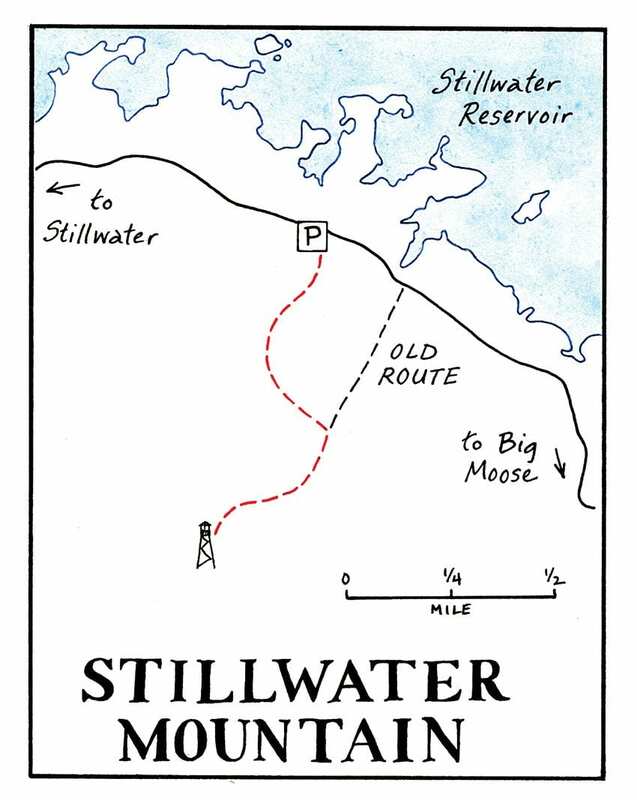 Terry Perkins was the forest ranger at Stillwater for many years and knew many of the observers, including the colorful George Clair, who was known to have a drink now and then. Perkins spent a good deal of opening day in the cabin pointing out the sights and regaling visitors with stories. Henry Baxter and his wife, Laurie, of Lyonsdale, were there, too. Baxter is the great-nephew of George Clair. They wanted to see the tower, of course, but they also wanted to meet Perkins. DEC Region 6 Director Judy Drabicki said she was gratified that the volunteers and DEC worked together so well and hoped it would be something of a model for similar efforts in the future. The view from the Stillwater Mountain fire tower. Kyle Kristiansen was using a metal-detector in a field in the town of Allamuchy, New Jersey, in the fall of 2013 when he dug up a heavy chunk of copper. It was a disk about two inches across and had a stem. The piece had engraving on it: “S.N.Y. ADIRONDACK SURVEY: VERPLANCK COLVIN SUPT. 1882” and “NO. 77.” Kristiansen thought it might be historically significant. Eventually, he reached John Warren of the Adirondack Almanack and Adirondack researcher Pete Nelson of Keene. Nelson, with the help of Jim Vianna of the Colvin Crew, a group of land surveyors with an interest in Verplanck Colvin, identified the piece as a triangulation bolt that had been placed at the summit of Stillwater Mountain by “S. Snell,” one of Colvin’s assistants, during the historic survey of the Adirondacks in the last quarter of the nineteenth century. The bolt had been missing for many years. Thanks to Kristiansen, it is now in the possession of the Colvin Crew in Wanakena, but Jim Fox was able to display it at the dedication ceremony for the restored Stillwater Mountain fire tower. 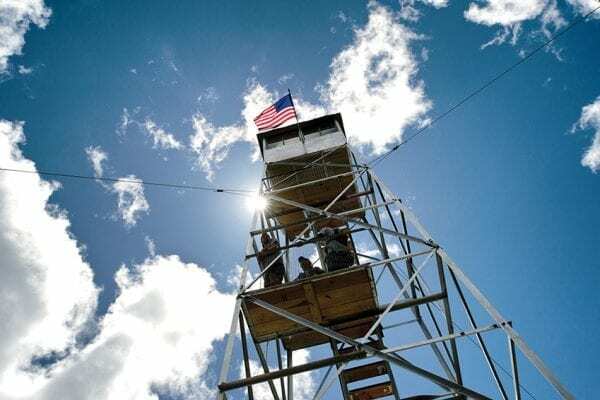 Fox said the bolt will remain with the Colvin Crew, but the Friends of the Stillwater Fire Tower hope to have a replica made and installed on the mountain.